This loop hike traverses the Brownhill Creek valley, through and beyond Brownhill Creek Recreation Park, up the Yurrebilla Trail and into Belair National Park. 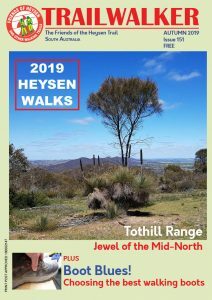 We then join the Waterfall Hike, which takes us past the picturesque rock escarpments of the park's upper waterfall, then onto fire tracks adjacent to Queens Jubilee Drive to rejoin the Yurrebilla Trail near the lower end of the park. Passing the Belair Railway Station, we follow a short section of local roads and then walking paths in Randell Park, returning to Brownhill Creek via the Mitcham Cemetery. The carpark on Brownhill Creek Road, at the start of the Recreation Park near the caravan park. Loop walk - returning to start. Slippery, muddy paths if recent rains, busy road crossings, shared bike / walker path in Randell Park. Bring lunch and water and wear footwear and clothing appropriate for the activity and weather. These walks are reasonably demanding and for walkers who have walked regularly in various terrain. They have a walking time of about 5 to 6 hours and will require a high degree of physical fitness. These walks generally occur on Saturdays or Sundays. If the forecast temperature for Adelaide is equal or higher than 32C, walks are cancelled. For simplicity, this can be determined the night prior to the walk from the 7.00 pm ABC News Adelaide weather forecast, based upon the Bureau of Meteorology's routine 4pm forecast. Even if the forecast temperature is later revised, the walk remains cancelled. In such a case walk fees will be refunded.